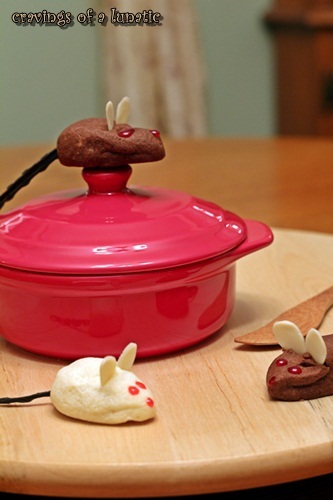 Mice Cookies are adorably cute for the holiday season. 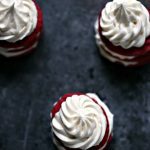 Super easy and fun to make. Happy Holidays! I am so thrilled today to bring you the first in a week-long series of Christmas posts. What’s really special is it’s not just me posting them but I’ve gathered an amazing group of bloggers to help spread Christmas cheer. Awhile back myself and Jen of Juanita’s Cocina were gabbing, as we do often. We thought it would be fun to bring together a group of bloggers who would help us kick off the holiday season. 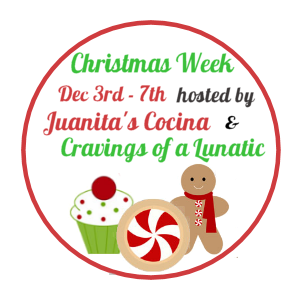 So you can look forward to Christmas posts all this week with tons of links to other bloggers who are participating. Each day has a special theme and we all put our own spin on it. I really hope you enjoy this as much as we all did. 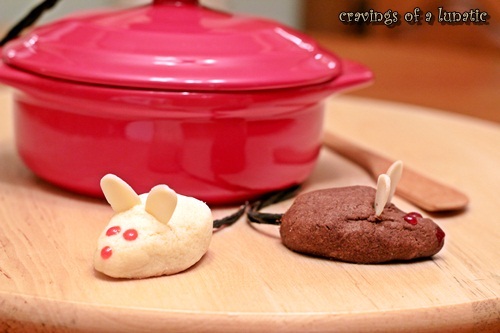 Mice Cookies are adorably cute for the holiday season. 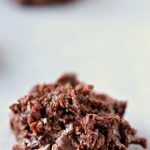 Super easy and fun to make! Whisk flour and salt together in a bowl. Set aside. In a stand mixer beat the butter until it's creamy, takes about 2 to 3 minutes. Add the sugar gradually and continue to beat until pale and fluffy, takes about 3 to 4 minutes. Reduce mixer speed to low and gradually add flour mixture. Split dough into two. Take one piece and wrap it up in plastic, stick it in the fridge for a minimum of 2 hours, and up to 24 hours. Pop the second piece back in the stand mixer and add about 1/4 cup cocoa powder and mix on low till blended. Wrap in plastic and stick in fridge for a minimum of 2 hours and up to 24 hours. When ready to bake the cookies, preheat oven to 350 degrees. 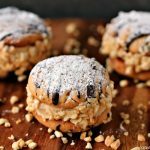 Remove cookie doughs from fridge. Scoop up about 1 tablespoon of the dough. Roll in hands and form an oval shape, then slightly elongate one side to form the mouse face. Pinch the bridge of the nose so you can form eye sockets. With a small knife make small slits at the top of each shape, which will hold the ears. Place an almond in each slit for the ears. 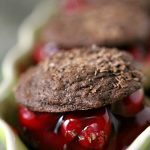 Place cookies on parchment lined cookie sheets about 2 inches apart from each other. Bake for about 15 to 20 minutes. Remove from oven and transfer to a wire rack. Immediately poke a hole so you can insert the tail. You can melt your chocolate and use that to make the eyes and nose. Or use gel icing if you like. Serve with a big old "I likey Micey" smile! 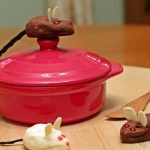 I used Martha Stewart’s Mice Cookies for inspiration for this recipe. I shall try to take some better photos in natural light. I got home from a conference in Virgina, and immediately got stuck in traffic on the bridge for most of the night trying to cross back into Canada. Hubs has my blog room painted but it’s still drying so taking food photos around here has become quite challenging. My photo lights are stored while we paint and redo rooms so it’s a bit complicated at the Bee household right now. Luckily I will be able to zip into the newly painted blog room/photo studio tomorrow and take some shots by the big patio door. Yah for natural light! 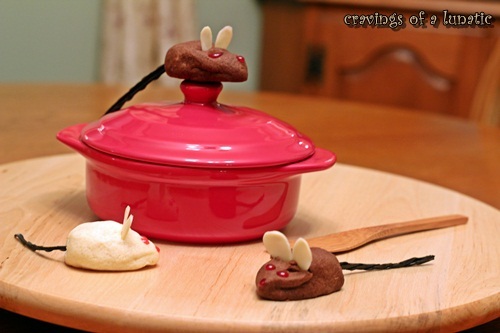 These mice are totally adorable and I sure hope you try them out for Christmas. I’m baking up a second batch tomorrow. Not only cute but yummy too! Thanks so much to Jen for helping get things organized for the group while I was away whooping it up at Mixed. I owe you a debt of gratitude Jen! Also a huge thank you to all the participants. You folks rock with your willingness to jump on board a new project. Make sure you all tune in tomorrow when we share our Peppermint Surprise Recipes with you! How adorable are these cookies! Almost too cute to eat! Heh. I want an email telling me all of the juicy details of your weekend, Make me jealous, woman. Love the mice. I am such a cookie scoop person, my kids will never see a molded, shaped cookie like these, but I love them anyway. These have got to be the cutest. thing. ever! What a great choice to kick off a whole week of awesomeness. Thanks again to you and Jen for including me in such a fabulous group of ladies. PS: Welcome back! Glad to hear you made it home from Mixed in one piece. PPS: A whole room for blogging? I’m dying of jealousy. DYING. Ahahahaaaaa omg these mice are the cutest things ever!!! Awwww, these are just too stinking cute! How adorable!! Swoon! My girls saw these and they love the little mice! 🙂 PS: You have a blog room??? These are adorable and just so much fun. I know the kids would adore them! These are so adorable! You are so creative. OMG I love these mice! What a great idea, Kim….and I’m glad you had fun at the conference! I can’t wait to see what everyone is making! Those are some cute meeses. And the only kind that I won’t kill with rat poison or by setting the cat on them. They look so-so cute! Lovely idea for Christmas week! Mice cookies would go down well with the kiddies at our Christmas get-together. There are 24 of us but only two young ones. It’s time for the next generation to start producing offspring. This looks great! 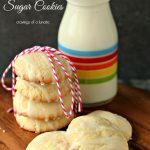 I cant wait to let my eight year old help me make these….she is going to love it! These are SO cute, and I’m so excited for you getting that whole blog room! The natural light makes me a little jealous, I am still hauling things outside half the time due to my awkward window situation 🙂 Can’t wait to see all the Christmas goodness! 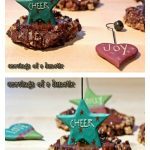 These are such cute cookies and what fun pictures! How cute are these?!! What a great start to Christmas Week. Thank you so much for including me–I’m having a blast and I love seeing what everyone has created! They are so irresistibly cute and delicious! Cute! I’m afraid to make them though because my little hero will either a – store them under the stove with his other toys or b – “kill” them. Cute mice! And a fun recipe. It’s a pain not having lights, particularly since it gets dark so early this time of the year. You’ll just have to make things earlier in the day! Good stuff – thanks.